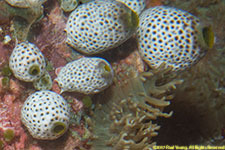 Tunichates are marine invertebrate animals. They are filter-feeders with a water-filled, sac-like body structure and two tubular openings (siphons)through which they draw in and expel water. The name derives from their outer covering, or "tunic", which is formed from proteins and carbohydrates and acts as an exoskeleton. ©2018 Mermaid Underwater Photographic. All Rights Reserved.